Article from St. Albert Gazette 27th August. Our crescent still bears some signs of yesterdays block party. There are still a few tables, a few toys and a few chalk artworks adorning the asphalt. While a casual observer might have some sense that an event of some sort happened, what they could not possibly see is what was actually produced by our block party. We played games and ate food, but the food and the activities are really just an excuse to hang out with the people we see regularly but don’t always know well. I’ve been to three local block parties now, and each time we get to know our neighbours just a little bit better. Yesterday was no exception. When I see my neighbours in the coming week, the experience will be different than the times I saw them last week… because of the many casual conversations that seem to happen so naturally at a block party. Connecting with your neighbours is no longer something that has to be done at the mailbox, over the back fence or while you’re mowing your lawn. With the introduction of a new web-based app, the St. Albert Good Neighbour Program is now looking to start connecting people digitally with the hopes of increasing the number of block parties in the city this year. Dale Fetterly, a volunteer with St. Albert Neighbourhood Watch, built a program that will let busy people connect with those around them to get the party started. So it turns out that St. Albert is the fourth best place to live in the whole of Canada, and the very best place to live in any province outside of Ontario (we were beaten by Ottawa, Burlington and Oakville). ermining their rankings is the crime rate. According to their numbers St. Albert’s crime rate has dropped by more than 45% in the last five years. At one level that drop is unsurprising because of the corresponding rise in the number of block parties. Two weeks ago I was at a conference called “Deepening Community,” and it brought together the leading thinkers and community development practitioners from around North America. I found the conference stimulating and through provoking, but I also found it extremely affirming. I feel confident in saying that St. Albert has one of the highest per-capita engagement with block parties in North America and probably the world. A safe street is produced by eyes on the street. It is produced by people walking around, sitting outside, knowing neighbours, and being part of a social fabric. No number of gates or professional security people on patrol can make us safe. Our block parties produce relationships, and relationships produce safety. Not only does neighbourhood connection reduce crime, but it improves our health, improves the economy and improves our overall happiness. No wonder we are one of the best places to live in the country. Our sense of community, however, will be tested in the coming years as more and more people from different backgrounds find a home in our beautiful city. A few weeks ago I was visiting a coffee shop with some friends from Syria. It was clear from the way my friends dressed and also from the way they spoke that they were not from Canada. The majority of people were polite and friendly, however a few were clearly uncomfortable and one lady in particular started yelling at them about their need to act more like Canadians. It was a sad and embarrassing moment. One of the most famous of Jesus’ stories (the story of the Good Samaritan) was about people of one ethnicity realizing that people of the ethnicity that most bothered them, were actually their neighbours who they needed to care for. In St. Albert we are on a journey to love our neighbours (check out goodneighbourproject.org). Increasingly we are going to discover that our neighbours may not look or sound like us… and that has to be ok. Lets make sure St. Albert continues to be one of the best places to live… for everyone. New project aims for block parties on every street. PAR-TAY! — Serge Poirier, Matt Garvin, Dale Fetterly, and Angie Dedrick party down to show their support for the Good Neighbour Project. The four are part of the project’s push to get a block party on every street in St. Albert. City staffers and local churches hope to get a party started on every street in St. Albert by bringing good neighbours together. About 35 people came out to a block party boot camp Tuesday at St. Albert Place. Many had heard about it through a new initiative called The Good Neighbour Project – a free online service that aims to bring party planners together. It’s part of the city’s ongoing strategy to build community engagement, explained neighbourhood development co-ordinator Angie Dedrick. The city started promoting block parties in 2006 due to recommendations from the Task Force on Vandalism and Youth Issues. They’ve now had 537 registered parties since 2008, and set a one-year record last year with 102. They’re aiming for 150 this year as part of a long-term goal to have a block party on every street, Dedrick said. So far, about one in three of the city’s 696 streets have hosted a block party since 2008. Dedrick said the idea for the Good Neighbour Project started last year when Matt Garvin, community engagement and mission pastor for the St. Albert Alliance Church, approached her and asked how the church could help promote block parties. “Right around the same time, I had read a book called The Art of Neighboring,” she said, referring to a book by Dave Runyon and Jay Pathak. The book described how a group of church leaders in Denver asked the city’s mayor how they could improve the city. The mayor said they could make a huge difference if they helped build a community of good neighbours. “What struck them was that whole commandment of ‘love thy neighbour.’ Maybe that meant your actual neighbour?” Dedrick said. The churches teamed up and encouraged their members to build non-denominational relationships with people in their neighbourhoods. Dedrick and Garvin brought this idea to the St. Albert Christian Ministerial group, which represents many of this city’s churches. The group liked it, and agreed to launch the Good Neighbour Project last month. Six local churches spent April teaching their congregations about the importance of neighbours using exercises from Runyon and Pathak’s book and promoting block parties, Garvin said. Many church-goers said that they wanted to host a party but didn’t know how or didn’t have the time, Dedrick said. That led Dale Fetterly, a member of the city’s Neighbourhood Watch Association (which provides free hot dogs and hamburgers for the city’s block parties), to create a searchable database for party planners as part of the project. Residents can register their name and contact information on the Good Neighbour website and specify if they want to attend, help with, or organize a block party, he explained. The website then automatically connects people who live on the same street so they can start organizing. It also acts as a one-stop-shop for traffic permits, barricades, sports equipment, and food should you need them for your event. About 60 people have signed up so far, and several have been paired up for parties, Fetterly said. He’s also had about 25 block parties registered this year – about twice as many as he had this time last year. Although churches were promoting this project, Fetterly emphasized that the initiative itself was non-denominational. Block parties are a great way to improve the safety of a community, Dedrick said. Residents can watch out for suspicious vehicles and open garage doors, and kids know whom to turn to in the event of an emergency. About 57 per cent of St. Albert block party organizers said they made new connections with neighbours last year through a block party, Dedrick said. About 21 per cent felt safer because of one. Dedrick said this website could eventually be used to organize other community projects such as Little Free Libraries should it prove popular. The project’s website is goodneighbourproject.org. Regular church attenders know that “love your neighbour” is one of the most important commandments in the Bible. We also know that many of us ignore that command. Over the last few weeks, six local churches have been preaching the same message in their weekly services. Together we have been focusing on that great commandment, but also facing the fact that there are two major forces that get in the way of us obeying it. The first major challenge we all have is time. Dallas Willard was a writer who had a big impact on a number of Christian leaders through the 1990’s and 2000’s. He asserted that you “must ruthlessly eliminate hurry from your life, for hurry is the great enemy of spiritual life in our world today.” I think I would take it a step further and say that hurry is the great enemy of life of any sort. The technological devices that were supposed to save us so much time, have in fact done the opposite. As a society we have more and more Facebook friends and less and less real relationships. The second major challenge we have is fear. It’s not easy to connect with people, particularly people who are not like you. It is easier to congregate with people who think, talk and act in ways that you are comfortable with. It is interesting that Jesus continually attracted criticism from religious people because of the company He kept. He lived from the truth that “perfect love casts out fear”. St. Albert is one of the best places in Canada to live, and therefore one of the best places to live in the world. Even here though, we need to take a long hard look at what it means to really connect with our neighbours. In addition to the fact that the Bible says loving your neighbour is important, all the sociological data points to the significant impact that this one simple strategy could have on all kinds of indicators like crime, health and the economy of the city. We need to make the time, and we need to get past our fears. To help with this, the churches in St. Albert launched the Good Neighbour Project in conjunction with the City and Neighbourhood Watch. 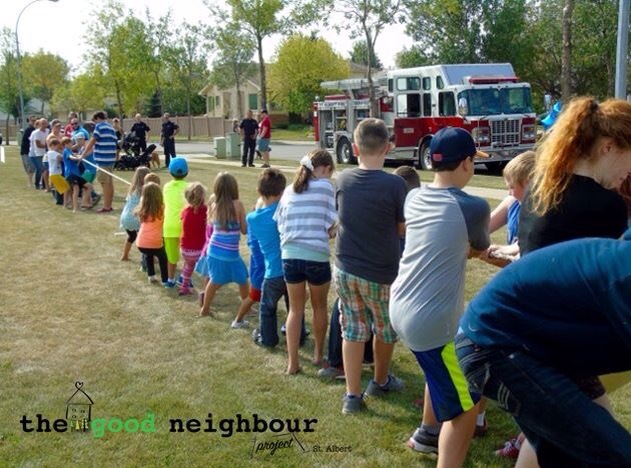 The purpose of the Good Neighbour Project is extremely simple: we want to see a Block Party on every block in St. Albert. We have created a website where it is possible to sign up at one of three levels: to simply attend, to assist with coordination or to coordinate a Block Party. We want to go from 100 block parties in 2015, to 150 in 2016. This would represent unprecedented growth, propelling us towards our big long term goal. About half the people who are signing up at goodnieghbourproject.org are not currently members of any local church or partner organization. This is very encouraging. If we are to truly reach our goal, it will be a whole community effort that gets us there. First Published, St. Albert Gazette, Saturday 30th April. What if there was one thing you could do to improve your physical health, improve your mental health, improve the economy, increase your happiness and reduce crime by 60%? Over the last 20 years there has been an ever-increasing body of research that demonstrates the remarkable benefits of one simple act: getting to know your neighbours. Not surprisingly, forward thinking local governments have taken notice of the research and have moved to be pro-active in encouraging neighbours to connect with one another. Here in St. Albert, the city has been strategically working towards this end, with one of the most successful initiatives being a partnership with Neighbourhood Watch (who have also read the research) to encourage block parties. Last year 4,896 people attended one of the 102 block parties held in our city. Last year, the City’s Neighbourhood Development Officer, Angie Dedrick, contacted several church leaders to talk about the possibility of churches taking a more pro-active role in encouraging our people to be good neighbours, and getting involved in block parties. Angie had read a book written by a Pastor in Denver, where the local association of ministers had received a similar request from their Mayor. The leaders in our city had a similar reaction that the pastors in Denver had: embarrassment. You see, loving our neighbours is not meant to be an optional extra for followers of Jesus. It was He who said that the whole heart of faith could be summed up as Loving God with all that you are, and loving your neighbour as yourself. Somehow we who regularly read our bibles can miss this very simple command. City residents threw a record 102 block parties in 2015. “It’s our biggest year ever,” said the city’s neighbourhood development co-ordinator, Angie Dedrick. The City of St. Albert teams up with the Neighbourhood Watch Association of St. Albert and St. Albert Citizen’s Patrol Society every year to help residents get to know their neighbours with block parties. The city offers resources like applications for street closures and tips on how to organize a party. There’s also recreation equipment that can be borrowed. The neighbourhood watch and citizen’s patrol groups provide free hamburgers and hot dogs once a year to each block party. The 102 parties is the first time in the last decade that the block party total has cracked the triple-digit mark. The previous high was 87 in 2013, and there were 78 in 2014. It’s all a far cry from the 15 held in 2005. “I think it’s just building momentum,” she said of why the last year was a banner one. Dedrick speculated that some new initiatives in 2015 might have helped drive up the numbers, like introducing block party mentors. The mentors are experienced block party planners who were available for rookies to ask for information and advice.